Along with supplying a wide variety of lathe machines, we also manufacture various Lathe Spare Parts that are used for the proper functioning of the lathe machines. These lathe spare parts are fabricated using high grade raw material and are dimensionally accurate. We have been supplying these parts in bulk so as to meet the ever increasing demands of our clients spread across the globe. 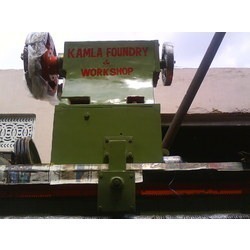 we are manufacturers of Revolving Steady Machines , suppliers of Revolving Steady Machines all over the world ,we are manufacturers of Revolving Tail Stocks , suplier of Revolving Tail Stocks , kamla foundry is providing best quality of both Revolving Steady Machines & Revolving Tail Stocks. We have been leveraging over the technological developments to manufacture a precision-engineered range of Revolving Tail Stocks. These are customized as per the specifications of our clients and we leave no stone unturned in maintaining the highest standards of quality while manufacturing our range. Offered at industry leading prices, these are reckoned for high performance and low maintenance. Looking for Lathe Spare Parts ?